We should have already landed in Cape Town a week from now for the start of our African Vacation. We’ve been planning it for almost a year and a half and it is finally here – crazy how it sneaks up on you as we still have a lot to finish up this week in preparation to be gone for over two weeks. 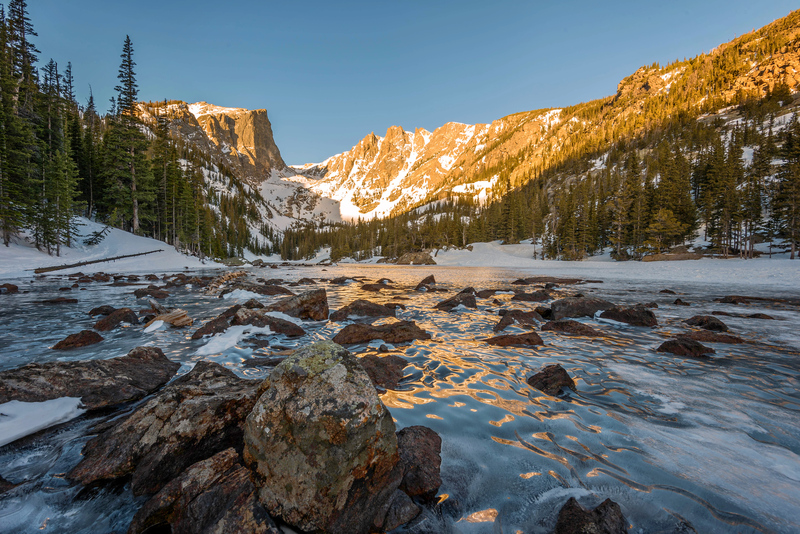 The image below is from one of my favorite and easiest landscape photography spots in Rocky Mountain National Park. An easy trail winds around the lake from the parking lot and brings you to this spot which – in the summer – has these two rocks prominently occupying the foreground of the image. I know I’ve posted a lot of Sprague Lake shots in the past but the blue sky in this one and clouds reflecting in the lake make it one of my favorites for non-sunrise/sunset times of day. During my last trip (and possible last trip for quite some time) to Rocky Mountain National Park in February I hiked up to the top of a hill over looking Trail Ridge Road which gave me tremendous views of the Continental Divide and the Mummy Range. For awhile it didn’t seem like the sunset was going to give me too much to work with but then all of a sudden the sky lit up and it was as bright as it was during the day. The colors all around the valley and over tops of the mountains was out of this world. I snapped shots for what felt like ten minutes before the color subsided. The Mummy Range is a (relatively) short range – around 13,000 feet – in Rocky Mountain National Park that is aptly named because if you look at it just right you can sort of see the face of a mummy laying on his back in the shape of the peaks. I never really noticed the shape of it until someone pointed it out to me but now when I look at it I see it plainly – it’s all in the imagination. Long’s Peak is a prominent mountain peak in the Colorado Rocky Mountains. Topping out at 14,269 feet it is one of 30+ 14k peaks in Colorado (I think that is the most of any state in the US…probably has something to do with the fact that they ‘cheat’ in Denver by starting over a mile above sea-level to begin with. I had spent the morning at Dream Lake taking sunrise pictures and was hiking back to the trailhead when noticed a huge lenticular cloud forming just above the peak. Lenticular clouds are sorta lens shaped clouds that look to me like UFOs. I’ve got several pictures where you can see the full formation over the broad peaks of the mountain. However, I liked the look of this tight shot where the peak seems to be emitting some sort of flame like dragon creature. With Game of Thrones on tonight maybe I’m just seeing Drogon everywhere though? One of the most easily accessible and thus visited lakes in Rocky Mountain National Park is Bear Lake. During the day the mile long, handicap accessible trail that circles the lake is packed with families with young kids and older family members who no longer get along as well as they once did. However, on this August night as the sun went down the area around the lake was surprisingly empty. It was chilly this evening – around 45 or so – which probably kept most visitors indoors. Admittedly, I wasn’t as prepared for the weather as I should have been but fortunately it wasn’t too far back to my warm car at the trailhead. “There is no place comparable to the Diamond [up Colorado’s Longs Peak]. It is high, cold, steep, a long way from the parking lot, and most of all, intimidating. Chasm View, or the Flying Buttress can get you acclimated, but nothing can prepare you for the Diamond but the Diamond.” — Malcolm Daly. It’s hard to make out the famous, unmistakable diamond of Long’s Peak in this photo but when the sunsets it is the last place the sun hits as it rises 14,259 feet into the air. I do want to climb it one day (you can hike to the top) but I need to get more acclimated to the high altitudes first before I’m ready to tackle that challenge. I hiked up to Dream Lake for sunrise to take in one of my favorite spots in all of Rocky Mountain National Park. Dream Lake is one of those spots that looks good in any type of light but my favorite time of day is sunrise because you usually have it all to yourself as you work the scene looking for interesting angles. However, as I took this shot and worked my way up the left bank several other photographers showed up a bit tardy to the party. By the time they got their gear all setup they had missed a lot of interesting light and color on the mountains in the distance. We are over in Paris for the week so my posting will be more sporadic than usual. So far the weather hasn’t been too cooperative for outdoor photos but we are in Paris so who cares – I’m sure I’ll come back with plenty of nice shots to share on the blog.